The man needs no introduction. Success and fame are synonymous with Amitabh Bachchan. Actor, host, entrepreneur. Big B is all that and more. 1. Amitabh Bachchan was born in Allahabad on October 11, 1942. 2. A typical Libran, Amitabh exudes charm, and yet has mood swings. 3. He is the son of celebrated poet Harivanshrai Bachchan and Teji Bachchan. 4. He was to be named Inquilab before his father finally agreed upon Amitabh, which means brilliance unlimited. 5. He attended the prestigious Sherwood School, Nainital, and graduated from Kirorimal College, Delhi, although he wanted to have passed through the hallowed portals of St Stephen's College. 6. During his school days, Amitabh dreamt of becoming an engineer. At one point, he even contemplated joining the Indian Air Force. 7. The Big B is ambidextrous, i.e. he can write with both hands. 8. Strangely enough, Amitabh always excelled at science subjects, but fared abysmally in languages. 9. His first ever job was in a company called Shaw Wallace. He also worked as a freight broker for a shipping firm, which went by the name of Bird and Co, drawing a four-figure salary and languishing in the club lands of Calcutta. 10. The 6-feet, 2-inch tall superstar was instantly rejected when he auditioned for a job as a reader at All India Radio. Ironically, it is his voice that has been considered one of his strongest assets. 11. The man who sleeps in the most comfortable of beds now, once spent a night sleeping on a bench at Marine Drive, Bombay. 12. Thespian Sunil Dutt gave Amitabh his first break with Reshma Aur Shera. 13. Had he not been an actor, AB says, he would be selling milk in Allahabad, his hometown. 15. Amitabh and Jaya met for the first time at FTII, Pune, and then again on the sets of Guddi. 16. Amitabh would have been the hero of his real life heroine Jaya's debut film, Guddi, as he was the original choice for the lead role. But finally it was who Samit Banja bagged the role. 17. He's very particular about neatness and orderliness. Even as a struggling actor, his two-room apartment was scrupulously clean. 18. He regards his younger brother Ajitabh as his best friend. 19. Being the conservative gentleman, Amitabh never formally dated Jaya. They always went out in groups. 20. Big B, for the media, is fondly called Munna by his parents and Amit by his close friends. 21. While Shah Rukh Khan and Nana Patekar got critical acclaim playing negative roles in Darr, Baazigar and Agni Sakshi, respectively, Amitabh played the part of a villain much earlier in Parwana opposite Yogita Bali. 22. While shooting for a fight sequence in Manmohan Desai's Coolie, Amitabh was knocked down by the film's villain Puneet Issar, due to bad timing, seriously injuring him. August 2 is regarded as the day when he got a new lease of life. 23. When Amitabh was in a critical condition after the near-fatal accident on the sets of Coolie, Jaya walked bare feet daily from Breach Candy Hospital to Siddhi Vinayak Temple, Bombay. 24. Like father, like son. Amitabh tries his hand at poetry once in a while. He also enjoys reading aloud his dad's poems. His favourite is Madhushala. 25. He is a vegetarian, who loves to gorge on simple food, like aloo puri, pakodas, dhoklas and parathas. 26. Besides making a hit jodi with the likes of Jaya Bhadhuri, Rekha, Zeenat Aman, Raakhee, Parveen Babi and Sridevi, Big B made a smashing pair with Dharmendra (Ram Balram, Sholay, Chupke Chupke), Vinod Khanna (Muqqadar Ka Sikander, Amar Akbar Anthony, Parvarish) and Shashi Kapoor (Kabhi Kabhie, Silsila, Deewar, Shaan, Trishul). 27. AB considers Waheeda Rehman to be one of the most beautiful women on earth. 28. Both the times Amitabh worked opposite Rajesh Khanna (Anand, Namak Haram), he ended up winning the Filmfare Best Supporting Actor Trophy. 29. While shooting for the late Mukul Anand's Khuda Gawah, Najibullah, the then President of Afghanistan, provided Amitabh with half the air force of the country for protection. 30. During the making of Khuda Gawah, Amitabh, who plays a pathan, developed blisters on his face due to constant application and removal of his fake beard. 31. Amitabh, a timid English professor who has to masquerade as the goofy Botany professor Parimal Tripathi, was not the original choice for the role in Chupke Chupke. Director Hrishikesh Mukherjee was planning on taking newcomers for the second lead, as opposed to Dharmendra and Sharmila Tagore. 32. Hrishikesh Mukherjee's Anand was modelled on his own friendship with the legendary Raj Kapoor, wherein Amitabh became Hrishida (Babumoshai) and Rajesh Khanna played the author-backed role. 33. AB loves gorging on gulab jamuns, especially from Jhama's in Chembur, Bombay. 34. It was during the making of Sholay that Amitabh discovered he was going to be the proud father of his first-born, Shweta. 35. Son Abhishek may be similar in looks, but daughter Shweta is temperamentally similar to her father, according to Jaya. 36. 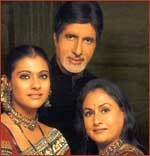 Amitabh is completely devoted to his family and makes it a point to have at least one meal with them. 37. He likes his meals to be served to him by Jaya. He would rather not eat than take his food himself. 38. A God-fearing person, Amitabh reads the Bhagwad Gita regularly. 39. AB has a penchant for watches and sunglasses, and possesses an enviable collection of both. 40. 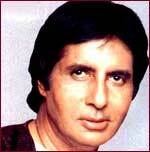 For someone who is not a professional singer, Amitabh has sung quite a few hit songs. Witness: Mere Angne Mein (Laawaris), Rang Barse (Silsila), Mere Paas Aao (Mr Natwarlal) and Tu Maike Mat Jaiyo (Pukar) , to name a few. 41. According to Amitabh, his kids (Shweta and Abhishek) are his severest critics, who run down everything -- from his clothes, hair, performance to dancing -- every time his film is released. 42. A small-scale comic book series about a character super-hero Amitabh, based on the star himself was published in the mid-eighties. The comic book story was later developed into a full-fledged film -- Toofan. 43. Amitabh is a punctuality freak. He always reports on time on the sets. 44. He never leaves the house without touching his parents' feet. 45. Fashion designers Abu Jani and Sandeep Khosla dress up Amitabh, along with the entire Bachchan clan, for ethnic outfits. 46. Amitabh nurtures an obsession for fast cars. 47. The actor, with a voice to die for, boasts of bagging the maximum number of quotable quotes in films. Runner-ups in this category are Raaj Kumar, Raj Kapoor and Dilip Kumar. 48. Amitabh has been diagnosed with a nerve-related disease, Myasthenia Gravis, which has now been prognocised as Gullain Barre Syndrome. 49. He loves Holi and is known to celebrate the festival of colours by throwing parties, at which half the film industry is invited. Part of the festivities includes bhang, colours and songs. 50. Zanjeer, which turned out to be a milestone in Amitabh's career, was first offered to Dev Anand, Raaj Kumar and Dharmendra. 51. Amitabh is the only Hindi film star whose film Shahenshah's videocassette came out in two parts. 52. Considering his superstar status, Bachchan has won few awards: National Award for Best Actor -- Agneepath (1991), Filmfare award for Best supporting actor -- Anand (1972), Namak Haram (1974) and Mohabbatein (2000). Best actor -- Amar Akbar Anthony (1978), Don (1979) and Hum (1992). 53. BBC Online voted him Star of the Millennium, above Hollywood greats. 54. A trendsetter, Amitabh Bachchan made a path breaking entry in the world of television with the Indian remake of Who Wants To Be A Millionaire -- Kaun Banega Crorepati. Going by the astounding success of the show, a good move by the savvy Bachchan. 55. Amitabh tried his hand at politics in 1984. He won the Allahabad Parliamentary seat on a Congress ticket by a whooping number of votes. 56. Amitabh is the only Asian to feature on BBC's Wogan Show. 57. Amitabh was one of the first to come up with a music album AB Baby for his music company Big B music. He even appeared in an imaginatively shot video by Rakesh Mehra called Eir Bir Phatte, which was an instant hit. 58. He has a replica of himself sculpted and displayed at Madame Tussad's wax museum in London, placing him among the historical and entertainment Hall of Fame. 59. At 58, AB jumped from a height of 30 feet, along with co-star Manoj Bajpai, for his latest film, Aks.